This new release focuses primarily on performance and stability. MindGems is proud to present an even faster 64 Bit version which also uses less memory. There are also some small fixes that provide better handling of long file paths and detection of missing sound device or service. This entry was posted in Audio Dedupe and tagged 64 Bit Duplicate File Finder, 64 Bit Duplicate Finder, 64 Bit Duplicate MP3 Finder, 64 Bit File Finder, 64 Bit Find Similar Somgs, 64 Bit Finder, 64 Bit Similar MP3 Finder, Ashisoft Duplicate File Finder, Auslogics Duplicate File Finder, Best Duplicate File Finder, Best Duplicate File Finder 2017, Duplicate Cleaner, Duplicate File Finder Free Download Full Version, Duplicate File Finder Open Source, Duplicate File Remover For Pc, Easy Duplicate Finder, Free Duplicate File Finder on November 21, 2018 by MindGems Support. Audio Dedupe can find similar files saved in various file formats by performing true audio analysis that does not require any ID3 tags. The tool will “Listen” to the audio files in order to find similarities in the audio content itself. Exact duplicates or remixes of the same song stored in various audio file formats can be easily identified by the software. Support for most of the popular audio formats is present and it is easy to organize songs in iTunes, iPod, iPad, iPhone or other mp3 player devices. Here are some of the supported file formats: MP3, MP2, MP1, MPA, WAV, OGG, AIFF, AAC, MP4, FLAC, AC3, WavPack (WV), Musepack (MPC) and Windows Media Audio (WMA) file formats. This new option was always ON in the past releases and now it can be disabled in settings. This allows sorting by any property without keeping the grouped files together. This option should be used with caution. This is particularly useful if a song with a lower quality has better ID3 tags that should be preserved. The tags can now be easily copied to the song with the higher quality. This entry was posted in Audio Dedupe on December 15, 2017 by MindGems Support. Audio Dedupe can already find similar files saved in various file formats by performing true audio analysis that does not require any ID3 tags. It “Listens” to the audio files in order to find similarities. The tool is able to identify exact duplicates or remixes of the same song stored in various audio file formats. Support for most of the popular audio formats is present and it is easy to organize songs in iTunes, iPod, iPad, iPhone or other mp3 player devices. Here are some of the supported file formats: MP3, MP2, MP1, MPA, WAV, OGG, AIFF, AAC, MP4, FLAC, AC3, WavPack (WV), Musepack (MPC) and Windows Media Audio (WMA) file formats. Yes we have added three new search methods and those are search by similar or duplicate “ID3 Title”, “ID3 Artist” and “ID3 Album”. Though the current search method of Audio Dedupe does not require any ID3 tags and recognizes the similarities between the files by comparing the actual audio content, the new scan methods may be pretty useful in certain cases. What is cool about this new feature is the fact that it finds also similar items and not just exact duplicates. For example the titles “Take The Power Back”, “Take The Power Back [Remastered]” and “Take The Power Back – Live” will all be matched as similar if the similarity level is set at 70%. This makes it easy to find different versions of the same song. This release also includes several bug fixes that are listed below. Fixed loading projects where decimal separator is different from the current locale decimal separator. Fixed: Group order is now preserved on project load. This entry was posted in Audio Dedupe and tagged Delete Similar Photos, Find Duplicate ID3 Tags, Find Duplicate Song Artist, Find Duplicate Song Title, Find Duplicate Songs, Find Duplicate Title, Find Dusplicate Album, Find Similar Album, Find Similar Artist, Find Similar ID3 Album, Find Similar ID3 Asrtist, Find Similar ID3 Tags, Find Similar Song Artist, Find Similar Song Title, Find Similar Songs, ID2 Tags, ID3 Tags, ID3 tags itunes, Similar, Similarityapp on February 12, 2015 by MindGems Support. Find Duplicate Songs, Organize Music Collections – Audio Dedupe 3.0.0.1 Provides Improved Speed And Accuracy! The new release of Audio Dedupe is packed with plenty of new features and improvements. 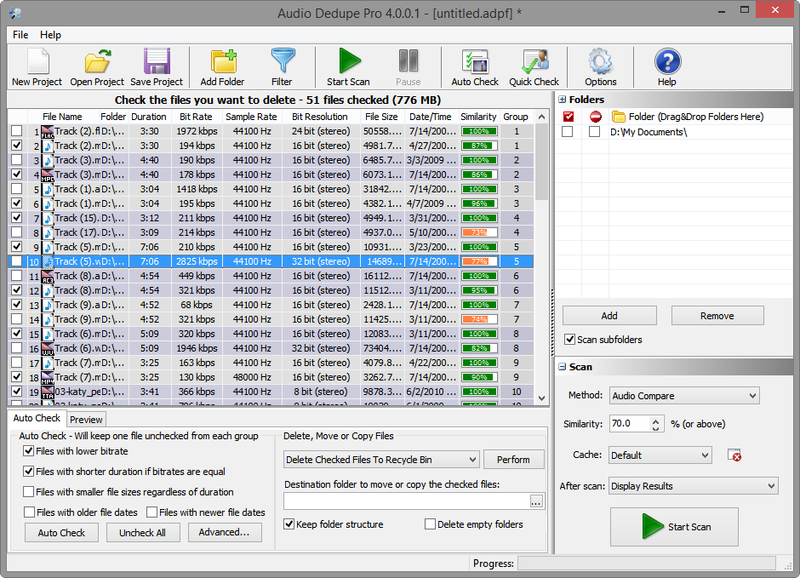 As you already know Audio Dedupe is a tool that goes beyond the features of the standard duplicate file finders available on the market. Unlike those tools it can find similar songs comparing audio content. This makes it capable of finding similar songs even if they are stored in different audio formats. The standard duplicate finders can not identify even exact audio file duplicates if they are stored in different file formats as they compare file data instead of audio content. While older version of Audio Dedupe could work with two alphabets simultaneously the current version lifts that limit completely. Now the tool can handle files named in any number of languages at the same time. For example files using Japanese, Chinese, Greek, English or other languages in their names can be compared without the need to switch encoding inside Windows. This release utilizes all the cores of a modern CPU. The comparison phase is now multi-threaded. This means that a scan will be 2x, 4x, 8x, etc. faster depending on how many CPU cores you have. There are also additional speed optimizations in the preprocessing phase that provide at least 30% better performance than before. Older versions of Audio Dedupe were limited to a minimum of 90 seconds of audio data necessary in order to compare songs. This limitations is now reduced to just 30 seconds which means that Audio Dedupe can compare more files than before. Usually songs are larger than 2 minutes, but this improvements helps when comparing sound clips or parts of songs. Some of the major new features include the improved folders list. It now provides the display of the Exclude From Auto-check and Exclude From Self-scan features. These are handy when comparing two or more folders for duplicates or merging songs from different locations. A “source” folder can be set in order to exclude the items inside from the auto-check feature and make sure that those are not marked for any move or delete operations. The results grid provides advanced sorting features. The new version can sort the items in the list by preserving the integrity of the groups and also sort the items inside the groups. 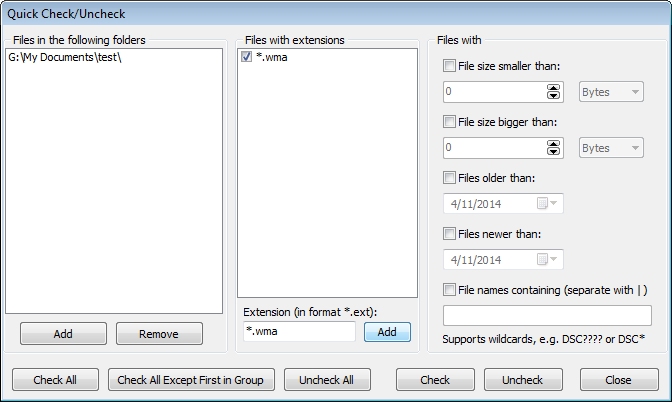 This means that the list can now be sorted by file size for example in order to get rid of the largest files first. A “Default” cache is added and used if no cache settings are applied. The currently selected cache is reused for new projects. Using the cache system can dramatically reduce scan time for consequential scans. Scanning files that are cached can be thousands of times faster. This entry was posted in Audio Dedupe and tagged Easily Delete Duplicates Itunes, Find Duplicate Audio, Find Duplicate Music, Find Duplicate Songs, Find Duplicate Songs In Google Music, Find Duplicate Songs In Itunes, Find Duplicate Songs In Itunes 11, Find Duplicate Songs On Computer, Find Duplicate Songs On Ipad, Find Duplicate Songs On Iphone, Find Duplicate Songs On Mac, Find Duplicate Songs Spotify, Find Similar Audio, Find Similar Music, Find Similar Songs, Itunes Music Duplicate Remover, Music Duplicate Remover on April 28, 2014 by MindGems Support. Finding similar songs and organizing audio files has never been easier. Version 2.9.0.1 of the popular duplicate mp3 finder Audio Dedupe is released and available for download. There are plenty of new features and performance improvements in the latest Audio Dedupe relese. The latest version of Windows 8 is now fully supported. This brand new release utilizes the new cache system that was introduced in our duplicate photo finder application recently and brings immense performance improvement. Searching for duplicate mp3 files can be more than 1000 (thousand) times faster when using the cache. The filtering dialog now provides an option to exclude certain files based on different properties like type, location, size, date, name and more. This provides a lot more flexibility when searching for duplicate songs. There is a new option in “Quick Check” – “Check All Except First in Group”. A new option “Show warning if all files in a group are marked for deleting” provides a higher reliability and will warn if someone tries to delete all the copies of the same song. Project loading times are optimized and now large projects will be loaded much faster. A new command-line -p option to save the project after scan is added. There are quite some optimizations applied to the “Browse for folder” dialog. It now displays much faster and can navigate to a path that is pasted from the clipboard. There is also ‘drag and drop’ support available inside Audio Dedupe and you can drag your folder from Windows Explorer inside the application in order to include them in the scan. There are plenty of other small bug fixes and improvements that you can find listed in the What’s New section. This entry was posted in Audio Dedupe, News and tagged Audio Manager, Delete Duplicate Songs, Delete Duplicate Songs iTunes, Find Duplicate Audio Windows 8, Find Duplicate MP3 Windows 8, Find Duplicate Music Windows 8, Find Duplicate Songs, Find Duplicate Songs Windows 8, Find Similar Audio Files, Find Similar Mp3, Find Similar MP3 Files, Find Similar Music, Find Similar Songs, iTuned Remove Duplicate Songs, iTunes Delete Duplicate Songs, MP3 Manager, Music Manager, Music Manager Windows 7, Music Manager Windows 8, Organize Audio, Organize MP3, Organize Music, Organize Songs, Organize Songs in Windows 8, Remove Duplicate Songs, Remove Duplicate Songs iTunes, Remove Duplicate Songs Windows 8, Songs Manager on April 15, 2013 by MindGems Support. Audio Dedupe Duplicate MP3 Finder verison 2.5.0.1 is released. There is new Quick Check/Uncheck functionality, which allows you to check/uncheck files by their folder, extension, file size, file date, etc. The move/delete window is enhanced and the Duplicate MP3 Finder will let you delete read-only files too. There is also check if the space in the Recycle Bin is sufficient to hold the deleted files when deleting to Recycle Bin. If you have manually checked some file the application will display warning if an operation will alter your changes. The enhanced support for Windows 7 now includes also support for symbolic links ( symlinks ). The fixes include some wildcard issues fixed in the filter dialog and 120dpi support. The new tab in options can be used to set which columns are visible in the results table. The PRO and Corporate versions of the duplicate mp3 finder software now include the option to export the results in XML or CSV file formats. 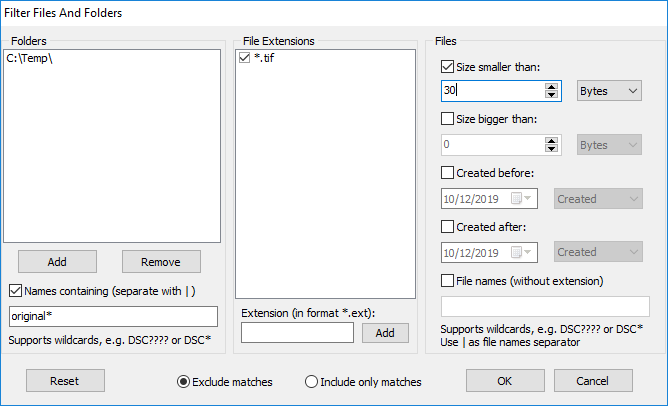 The CSV file format can be viewed as a table directly in Excel. An option to delete empty folders during the delete operation will keep your folder-tree tight. The new Compare Folders menu item is available in the Professional and Corporate versions. It will let you easily compare a folder with audio files with one or more folders. Please check the Audio Dedupe Comparison table and Audio Dedupe What’s New section for more details. This entry was posted in Audio Dedupe, News and tagged Audio Comparer, Audiocomparer, Clone Remover, Compare Audio, Dedupe, Delete Duplicate Files, Duplicate, Duplicate File Finder, Duplicate Finder, Duplicate Mp3 Finder Tool, Find, Find Duplicate, Find Duplicate Files, Find Duplicate Mp3, Find Duplicates, Mp3 Duplicate Finder on December 6, 2011 by MindGems Support.